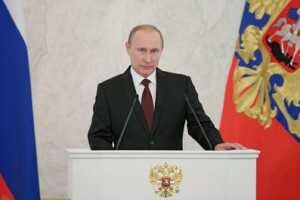 The Kremlin website published this photo of Putin with his speech. This may sound odd, but it is possible to feel sorry for Vladimir Putin. The president of Russia wants his country to achieve better results in the economy and also in, among other things, education and health care. But judging by a long speech he gave to the Russian Federal Assembly on Dec. 12, progress has been stymied by bureaucracy, corruption and general inaction. Putin ticks off Russia’s many problems, including illegal immigration and ethnic strife. He pleads for action to boost the economy with science and innovation. He proposes tax holidays for job-producing investments. He complains about offshore tax evasion. In general he sounds like Peter the Great, trying to push his fellow Russians to catch up with the modern world. But not on one particular issue. He draws the line on gay rights. *Nikolai Berdyaev, 1874-1948, was a Russian Christian philosopher.